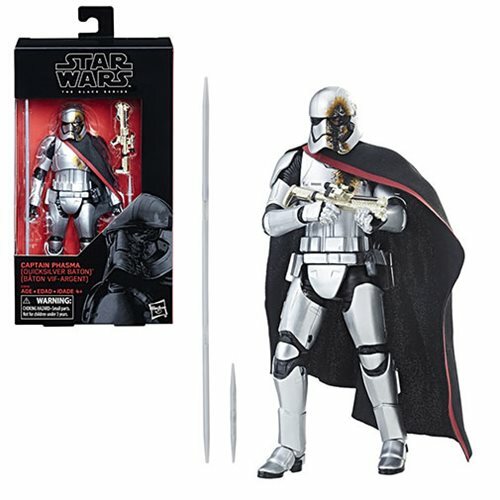 Kids and fans alike can imagine the biggest battles and missions in the Star Wars saga with the Star Wars The Black Series Captain Phasma 6-inch Action Figure - Exclusive! With exquisite features and decoration, this series embodies the quality and realism that Star Wars devotees love. Clad in distinctive metallic armor, Captain Phasma commands the First Order's legions of troopers. Having survived the destruction of Starkiller Base, she has a personal score to settle with the Resistance. This 6-inch-scale Captain Phasma figure is carefully detailed to look like the character from Star Wars: The Last Jedi. This figure features premium detail and multiple points of articulation. Ages 4 and up.